“Give me your children” – surely the most chilling words that any parent could hear, especially when they know that, if they do, the children are going to their deaths, but if they don’t the children will be taken nonetheless. In 1942 these words were spoken by Chaim Rumkowski, known as “The Eldest”, a Jew appointed by the Nazis as leader of the Lodz Ghetto. He believed that by handing over the very young, the elderly and the sick, others in the ghetto would not perish. 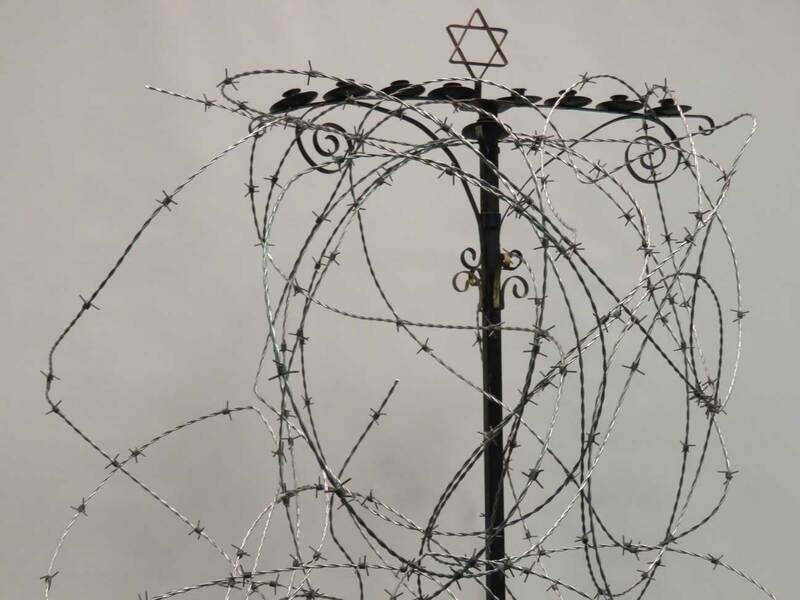 On Wednesday evening, 11 April, Erev Yom Hashoah, the story of the Lodz Ghetto was told in the words of the inhabitants of the ghetto themselves, using extracts from diaries, newspapers and other documents that had been hidden away, all heart breaking accounts, first of hope and then of despair. In 1942 more than 200,000 people had passed through the ghetto, of whom only 7,000 survived, the rest being sent to extermination camps or dying of cold, starvation and disease in the ever more squalid conditions. 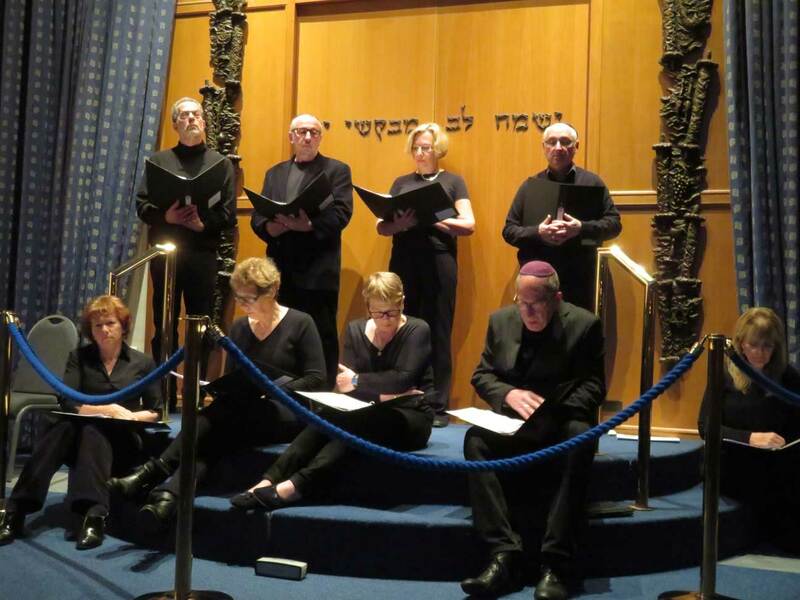 In the poignant presentation we heard some of the voices of these few survivors, recorded much later on, singing the songs that had been sung in Yiddish and in Polish during those terrible days. The evening began with the lighting of the memorial candles in the Zachor, followed by a service led by Yom HaShoah Chair Jean Cohen and Rabbi Kath. 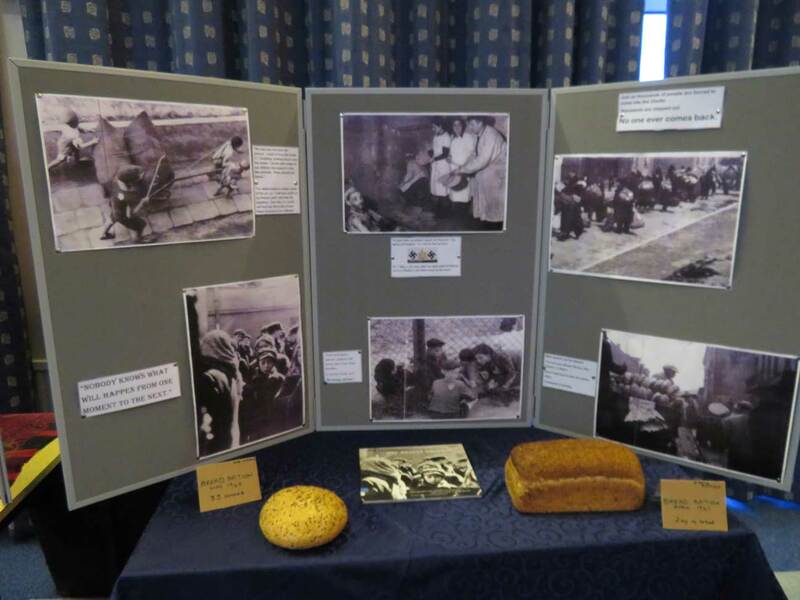 Setting the scene were chilling ‘props’ including barbed wire, a display of vegetables and bread – priceless commodities in the ghetto, and a facsimile of the actual sign at the entrance to the Lodz Ghetto stating: “WOHNGEBIET DER JUDEN BETRETE VERBOTEN” (Entering the residential area of the Jews prohibited). Displayed around the synagogue were photographs taken secretly by Mendel Grossman, who lived in the ghetto and had previously been a journalist. They showed the horror and extreme hardship of daily life. Also displayed were translations in English of the songs played during the presentation, with their context and history. The extracts from the diaries were read by Peter Kammerling, Neil Higgins, Val Levy, Stuart Lanceman, Alison Benjamin, Ann Lanceman, Tina Higgins, Carol McEwan and Paul Glicker, who also introduced the programme. Many members of Paul’s family perished after being deported from Lodz to Auschwitz. 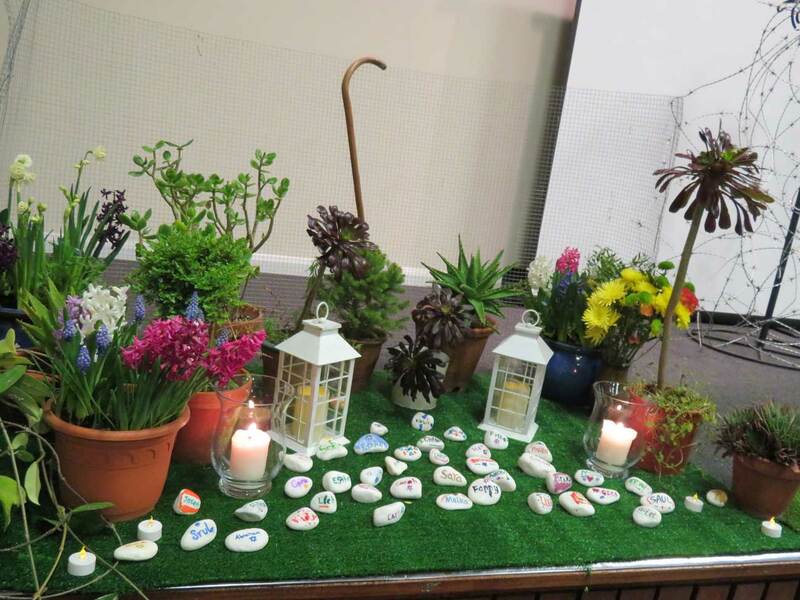 The presentation ended with each of us laying a stone, decorated by our Cheder children, in the Remembrance Garden, which had been set up on the stage. Each stone had the name of a person from the Lodz Ghetto who did not survive. It was a deeply moving yet wonderful evening. Thank you, thank you to everyone involved in putting it together and for bringing this tragic story to life so vividly.